Heat oil in 10-inch skillet over medium-high heat. Cook onions and carrots in oil 3 to 4 minutes, stirring frequently, until crisp-tender. Stir in mushrooms and bell peppers. Spoon vegetables into 4- to 6-quart slow cooker. Stir in remaining ingredients except spaghetti and cheese. Cook and drain spaghetti as directed on package. Serve sauce over spaghetti. Sprinkle with cheese. Depending on how you prefer the consistency of your sauce, you can serve immediately or remove the cover and cook for an additional hour to further thicken it. 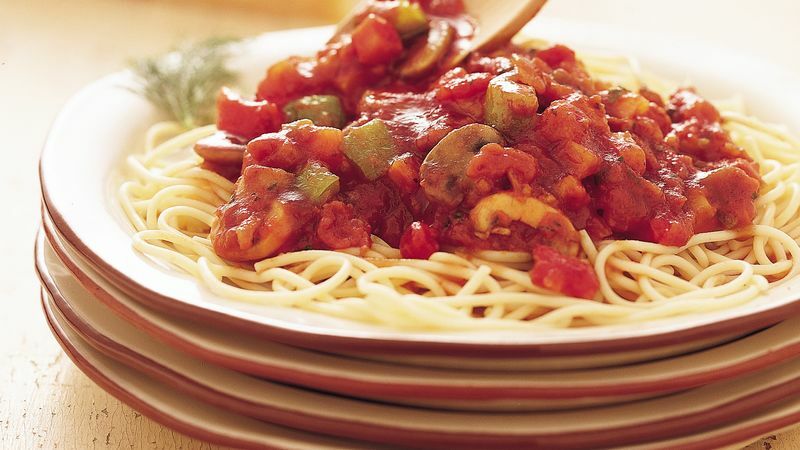 Use this versatile spaghetti sauce on homemade pizza or in lasagna. Stir about 2 tablespoons of chopped fresh parsley into the sauce during the last 5 minutes of cooking.